I am passionate about supporting communities in their work to become more equitable, affordable, and sustainable. My work builds on existing assets: people, heritage, buildings, and neighborhoods. I have completed numerous neighborhood planning projects. Most work has been with SCIDpda and has focused on Seattle's Chinatown International District, a dense, culturally rich neighborhood where low-income residents of color face high displacement pressures. I use GIS analysis and community input - via culturally competent focus groups, interviews, and surveys - to produce results that reflect neighborhood complexity. 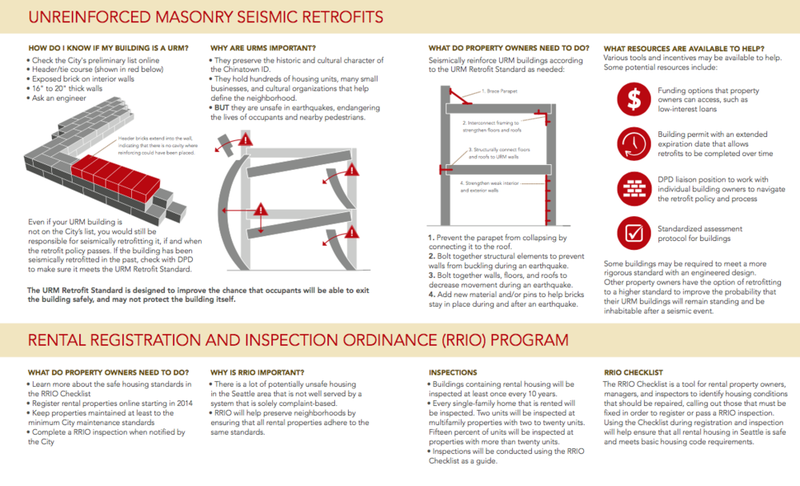 Click below to read about the Unreinforced Masonry Buildings and Community Preservation project, which examined the impacts of local policies on historic buildings. I know how to translate technical preservation and planning concepts into plain language - and sometimes other languages entirely, ensuring that ESL and non-English speakers understand important ideas. Whether through one-on-one conversations, workshops, open houses, or publications, I am practiced in supporting community members in engaging with public processes and making informed decisions. I also write and manage grants for building rehabilitation and repairs - more than $1.2 million since 2010. I organize events that bring people together to share ideas and activate public spaces. From focused workshops to pop-up parks to a highway-underpass dance party, I work creatively and collaboratively to convene people with diverse backgrounds, ages, and interests.